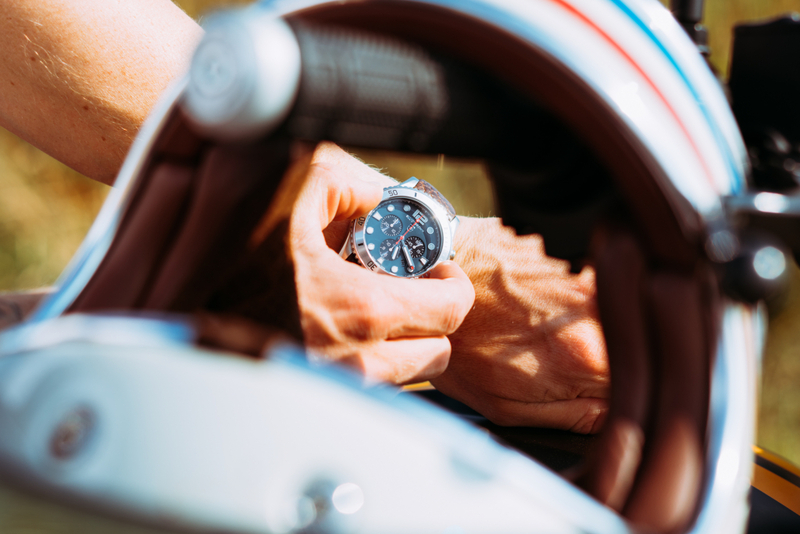 When our good friends at Elliot Brown watches got in touch and asked us about some of our favourite road trip destinations, we immediately started spouting exotic locations, sunnier climes and empty road networks, until we realised we sounded like dicks. 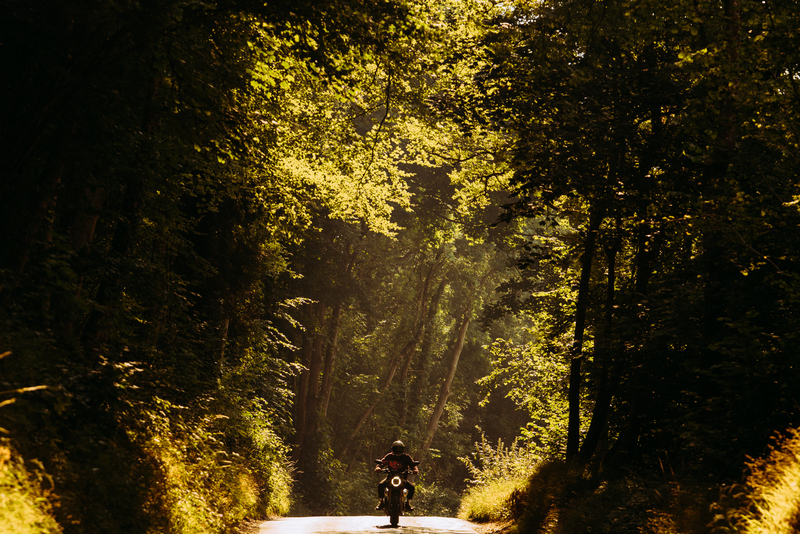 “Have you ever taken in some of the scenery that’s just on our doorstep?” came the reply, and with that, we were stumped. 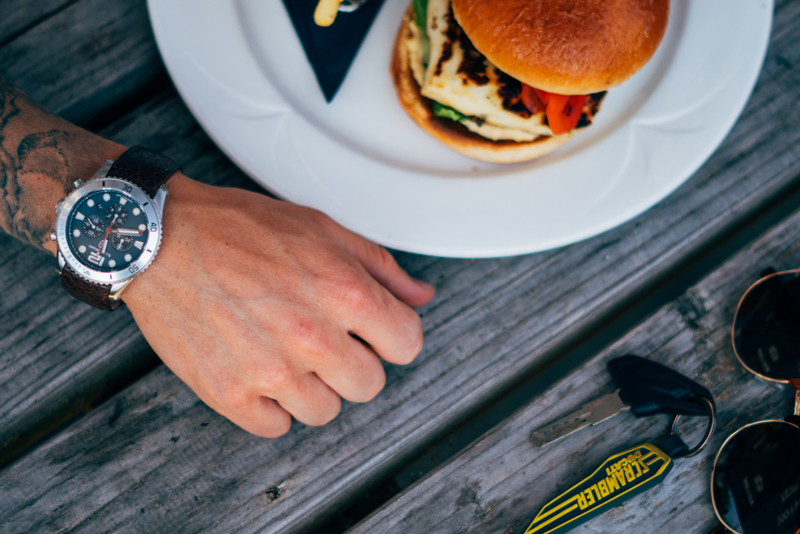 There is a reason Elliot Brown has named some of its fine timepieces after the picturesque villages that are dotted along the Jurassic Coast and it’s because they offer some of the finest vistas in the UK. With that, we decided that the best route for this test ride would head out from Flat-Out HQ in sunny Christchurch and head along the coast towards Kimmeridge, Tyneham and Lulworth, taking in Canford, Broadstone and Bloxworth to discover what makes theses places worthy of having a watch named after them. 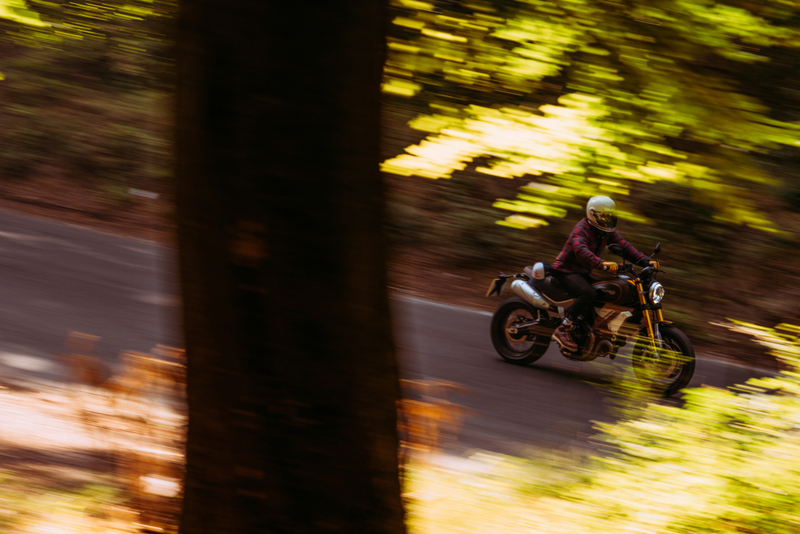 The precision piece of apparatus for this particular trip would be the stunningly muscular Ducati 1100 – the pumped-up version of the Italian marque’s extremely successful Scrambler series and the more powerful version many purists have been waiting for. 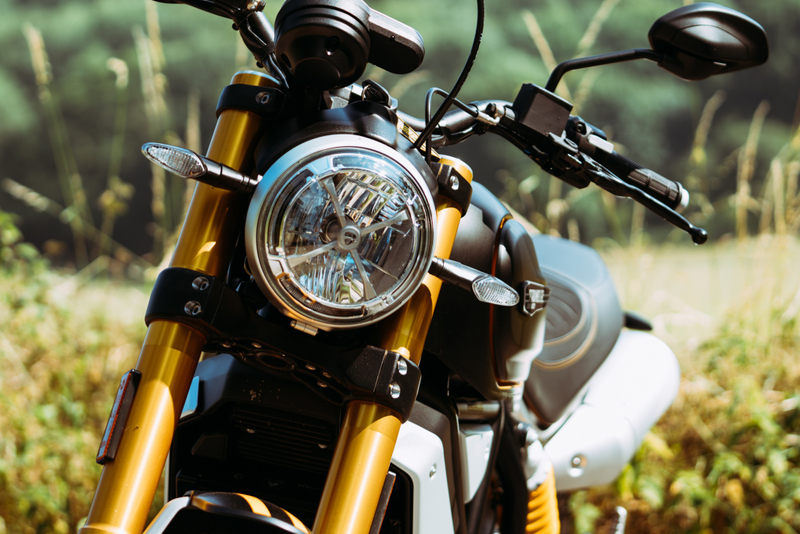 The 803cc Scrambler Icon, Desert Sled and Cafe Racer instantly struck a chord with a new generation of bike fans looking for something stylish, practical and easy to throw around town but perhaps one of the only criticisms was a lack of punch. For a Ducati, which is known for delivering gut-busting performance, these little retro wonderkids felt very much like a first bike, or a stepping-stone to larger machinery. Sit on a motorway aboard the Cafe Racer for long enough, and it soon becomes apparent that a bit of additional shove wouldn’t go amiss. 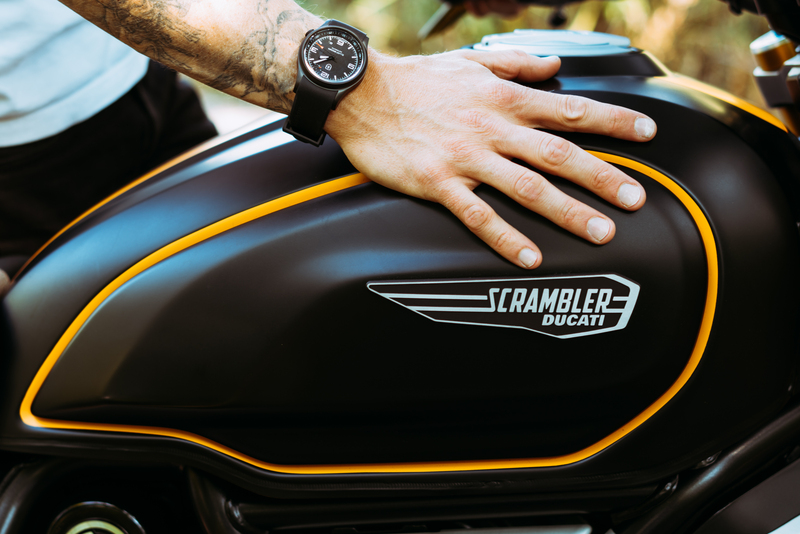 However, the success of Scrambler would suggest that Ducati didn’t have to bother fashioning a new motor, adding expensive driver aids and more powerful brakes just to please a select few but they did, and we’re glad. Chunkier and more aggressive to behold, the bike feature and intricate twin pipe system that elegantly twists its way from the big lump, wraps underneath the frame and finally exits out of two big cannon mufflers housed underneath the big, flat seat. 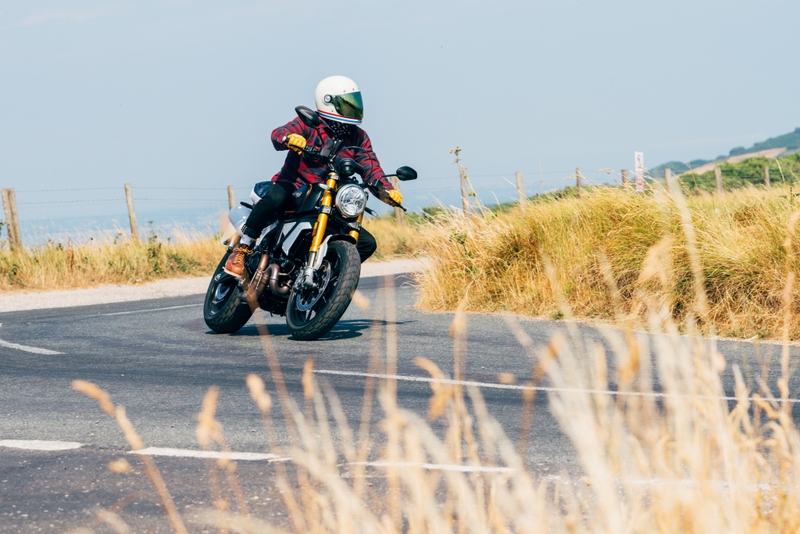 Overall, it’s 50mm wider, 69mm longer and the seat is 20mm taller and 43mm longer than its smaller Scrambler sibling, meaning it can comfortable carry a pillion passenger, even if there isn’t much to grab onto. The bars are brilliantly flat, while the stubby levers require minimal effort to operate, and the seating position is nice and upright, giving the rider a superior feeling of control over the machine. 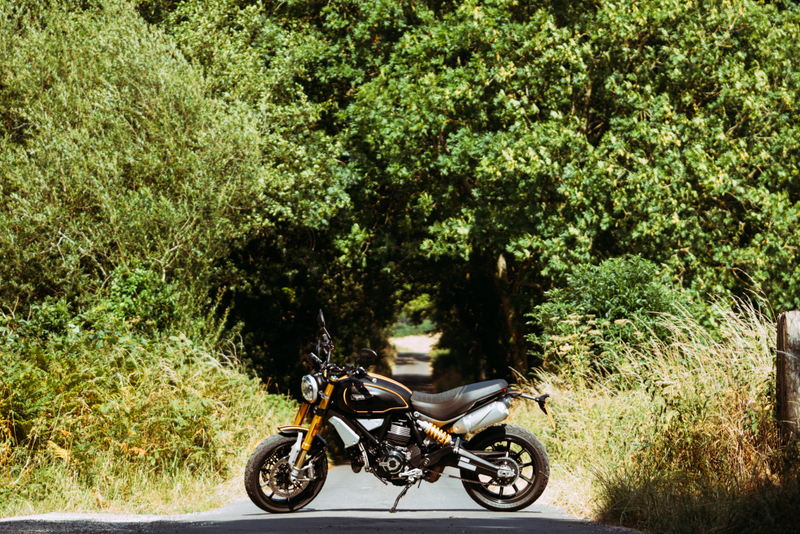 Much of the journey along the A31 is littered with caravans and weekend traffic, making swift progress difficult, even on a machine with 88Nm of torque to play with, but the Scrambler 1100 is easy to thread through traffic. It still feels agile and nimble, despite its jacked-up bodywork, while the clutch action is smooth and predictable. Gear shifts do require some thought, as there was more than one occasion when I accidentally hit false neutral when cycling up the cogs, and that engine does feel lumpy at low revs but riding through town soon becomes second nature. 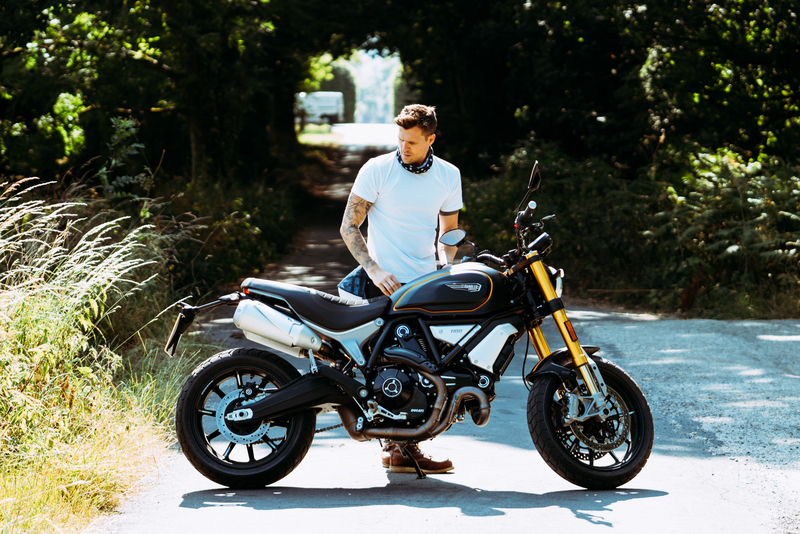 Get the Ducati Scrambler 1100 up to cruising pace on smooth roads and it is a delight to ride, comfortably sitting at motorway speeds and beyond without any fuss. 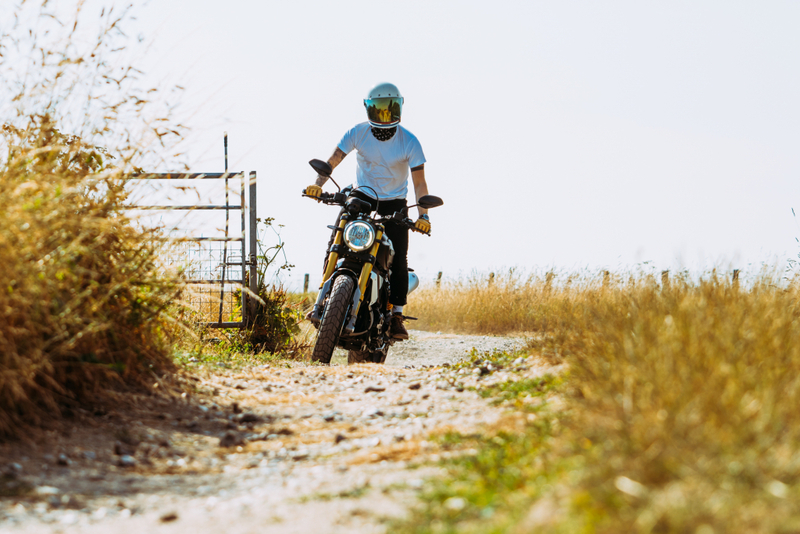 The stiff frame – coupled with the fully adjustable Ohlins forks on this Sport model – do make the ride a bit bumpy when the road surface becomes rutted and bumpy, but it is pleasing to know the Scrambler can still handle itself on the gravel. However, proper skiddy stuff is often thwarted by the clever traction control system, which offers numerous modes for safer on-road riding but can be turned off completely by rifling through the menus on the neat digital displays. The addition of twin discs and calipers up the front means stopping power is mightily impressive and even a light feathering of the right lever is enough to scrub off a massive amount of speed – great for those regularly riding in busy cities. It might not boast the power figures of Ducati’s sportiest models and it doesn’t quite have the charm and chuck-ability of the Desert Sled, but this feels like a proper big bike that also happens to look ridiculously cool. On the winding country roads surrounding Kimmeridge and the Purbecks, it delighted with its precise handling and impressive cornering abilities, while the more mundane long distance duties were surprisingly effortless and comfortable. The 15-litre tank means it’s possible to travel over 100-miles without a stop, which is surprisingly easy given the relaxed seating position. 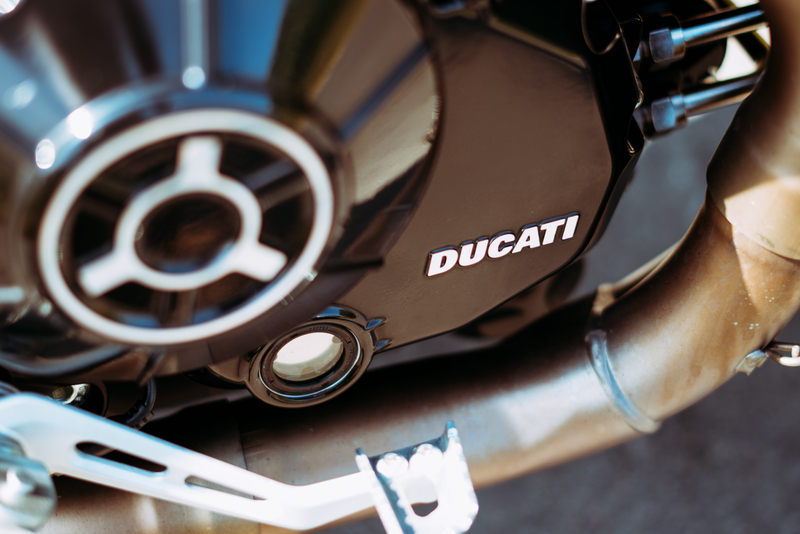 Ducati commands big money for its motorcycles and at £10,695 for the standard model, some will likely gravitate towards the cheaper retro-modern offerings from the Japanese brands. But very little can compete in the outright cool stakes and Ducati shoehorns in an incredible amount of tech and build quality for the money. 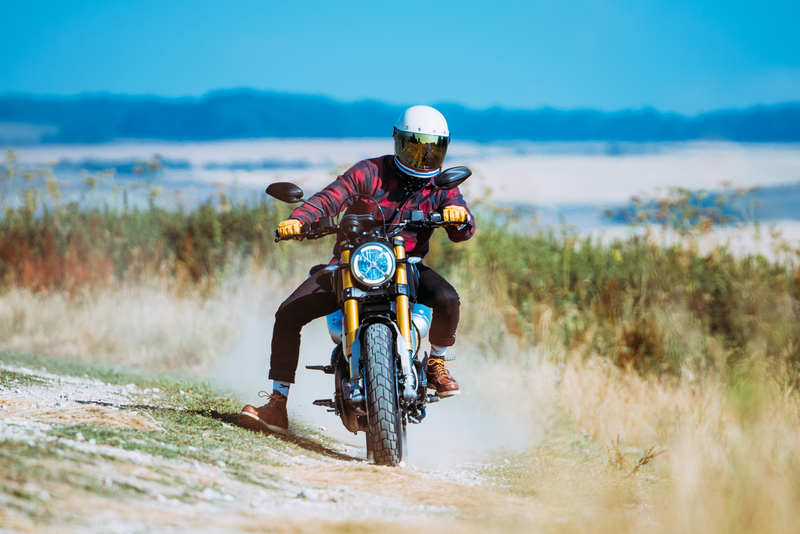 With the addition of the 1100, the Scrambler range now has something to suit any taste.